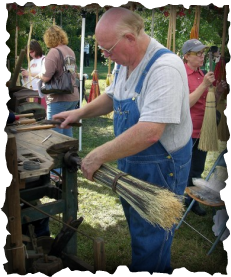 Hand made brooms made by Wayne & Leesa Thompson---Leighton, AL---256.446.5555. Making brooms since 1967, we have shown all over the Southeast. Constructed with all natural broom corn built on various handles using 1800's broom equipment.